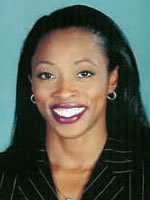 Shared a fun phone conversation this week with Gail Devers, Olympic champion in athletics. An Atlanta resident, Devers was on site at the Carver School of Health Sciences & Research for an appearance to speak about the importance of balance, exercise and eating well. We also chatted briefly about her role with the GE BEE Healthy program (disclosure: GE is a client of Edelman, my employer). On the same day in Atlanta, the GE Foundation announced selection of two Atlanta area non-profit community health centers -- West End Medical Center and Southside Medical Center -- will split $1 million in grants. Devers impressed me for her positive outlook at the points she made about doing things with a high standard of excellence and thoughtful approach. We started the conversation going way back to her own school days in California, where she graduated high school a Class of '84 member, just in time for the Los Angeles Olympic Games. "I went up to L.A. [as a spectator] ... for the Olympics," said Devers, responding to questions about the extent to which the Los Angeles Olympic competition inspired her career. "Sitting in the stands, looking at the best runners, seeing Florence [Griffith-Joyner] get silver ... this all made me strive the best I could be. "Before 1984, to me the Olympics as 'history' in that I was a fan of famous runners, like Wilma Rudolph," said Devers. "L.A. put it in my head, 'I will compete for as long as I can." We also talked about the five Olympiads at which Devers competed: Seoul, Barcelona, Atlanta, Sydney and Athens. Devers is now the mother of a two year old and kindergartner. "I always regarded myself as health conscious, but it is important to be fit 'for life' not just an athletic career," said Devers. "I want to stay fit and hang out with my two- and five-year olds!" Staying in shape was among the key messages Devers sought to share with the young adult audience in Atlanta. "It is important to set goals, but if you are not living right, it's lost potential," said Devers. Devers also shared detail about her former role with Chicago 2016 and the U.S. Olympic bid, noting her location for the Oct. 2 announcement of Rio's successful bid. "I was home [in Atlanta] watching CNN," said Devers. "Unfortunately it wasn't meant to be for Chicago."